One of the reasons I like 80/20 so much is the ability to reconfigure it as needed. Yesterday I had to flatten a worktop made of recycled Brazilian Cherry flooring shorts. The top was cupped in the center; the worst spot was about 1/8” low. It was the first really beautiful spring weekend we have had this year (the Laughing Gulls are back, what I consider to be the “official” start of spring) so the bonus was being able to set up the cutting/clamping table outside. This setup is just another take on the router sled method for flattening a surface. The extrusions are the 15 series profile, after leveling everything I spent an hour running the router w/ a 30mm bottom cutting bit back & forth, followed by another hour of sanding and then on to the Osmo oil. Along with the 80/20 a couple slotted plates made out of ¼” by 2” aluminum bar get used a lot to hold extrusions together as router guides, etc. At the end of the day the table breaks down in 10 minutes and takes up minimal room on the shop wall. I find that having a couple full 97” lengths of 1515 around, along with a bunch of different shorter pieces, is handy to whomp up different jigs as needed. Great use of 80/20. Love that stuff! I don't know whats nicer... that 8020 table or the big green egg in the background. The egg, which is about 12 years old, is basically being held together by that table. The bottom is split in two, crack has widened to 3/16", my own fault. It is difficult now to control temp, and it won't smother leftover charcoal at the end of a cook anymore. I stopped in at Fred's Music and BBQ in Shillington PA earlier today and checked the price for the replacement bottom, $420!!! Seriously considering replacing it with the Kamado Joe @ $749 for the comparable model. They recommend it but I need to do some research myself. Yesterday we did pizza on the egg, which as noted below has a cracked bottom that has widened now to about 1/4". The top also shifted due to the crack & I can no longer regulate temperature via the top/bottom vents. 6+ minutes for the 1st one, then <4 minutes for the 2nd. Should have clued me that the temp on the stone was rising pretty fast. The third pie was one our friend brought over and the dough was really really moist and gooey, when we slid it onto the stone if went Ka-blooie!!! Spent the next few hours wetting the table until the load of charcoal burned itself out. Next week I will pick up the Kamado Joe as a replacement. Happy Easter to you also. Before you get rid of your green egg, try some Refractory cement. It's what they use in charcoal forges, and also it's real common for rebuilding the bottom of cast-iron wood-burning/coal stoves. I use it to repair cracks in my cast-iron stoves. I've seen a lot of questions on cutting this stuff. There really is not more difficultly in cutting it then there is cutting wood. As people have said clamping is necessary and a slow feed rate. Other than that no one should be afraid of getting good results with cut to length machining. This stuff is surprisingly soft, even handsaws and drill bits cut easily. If you haven't done metal work before don't worry about it, you'll be fine. 80/20 is set up so you don't have to know any real metal work! Jump I'm and go for it! Don't expect to cut aluminum exactly the same as wood. Any thickness over 1/8" and you should cycle the blade in and out of the material. Any triple chip blade will work but a blade with negative rake is best to avoid self feeding. I cut anything up to 1" with my Makita 10" chop saw but do not force the blade. I just cut a 6" wide X 1" thick piece for a mag lock spacer and even cycling I popped the circuit breaker twice. Would I be able to cut Incra T-Track + the same as 8020 since that is aluminum also? My main concern is dulling my TS55 blade. I would only be making one cut to cut a piece of Incra track in half. I'm assuming the 1 cut would not dull the blade noticeably. Correct? I have cut 1/4" 6061 on my table saw with no issue. They sell a 'wax stick' that you can use to help keep the blade slippery and cool, and it helps a lot. Not sure what effect the wax would have on wood, so I either use a different blade for wood or clean it up with lacquer thinner after use. There are several of us here, myself included- some reluctantly - some not - who can attest to the fact that the Festool blades can accidentally or not make an accidental or purposeful cut in aluminum guide rails, MFT extrusions, MFT fences, etc without noticeable harm to the blade on the occasional basis. If you are going to purposely make the cuts more frequently then there is a non ferrous cutting blade available. There is a bunch of 14mm stainless rod left over from our staircase handrail project so I decided to use it to make shop wall brackets to hold clamps, etc. 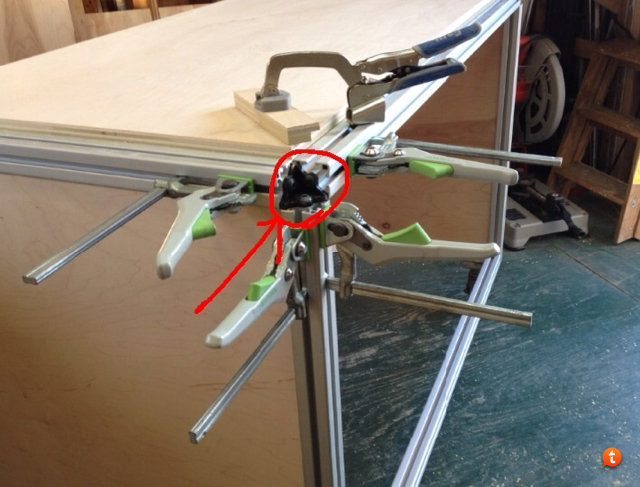 Ideally the rods need to be at a slight angle of a few degrees to prevent stuff from slipping off too easily. Love being able to repurpose pieces and parts as the need arises. So, from the responses before and after my post, I'm getting the feeling that 1 cut of T-Track with the standard Festool blade wouldn't harm it. Given that I would never cut into my MFT rails (Ha, have cut too deep into the top already; just not the rails) I won't worry. I also have a Bosch jig saw for which I have metal cutting blades and probably could do that. I was just looking for a way to make the cut smoothly so the T-track ends would be "professional" instead like the ends of a steel pipe I've cut with a hack saw. In regards to dulling your blade... your cutting aluminum with carbide. Not a chance of ever dulling. Aluminum is a "sticky" metal however. If cutting thin, less than 3/16", and are not making that many cuts, you don't need to lub. Thick extrusions and lots of cuts will necessitate using a spray lub... we buy WD40 by the gallon and deep it in cheap spray bottle... spray the blade occasionally, no need for a continuous spray unless cutting 3/4"+. I use a scrap piece of brass to cut and clean galled aluminum off my blades and occasionally remove the blade and clean the body with conditioning belts. This body cleaning is essential when cutting a lot of acrylics or polycarbonates. I thought that the Big Green Egg had a lifetime warranty? Yes - IF you register it when purchased, something I apparently did not do 10-12 years ago. Also, in truth, the original crack was caused by a modification I installed. Some welded steel brackets that raised the grill, but were inserted between the inner fire box and outer shell, a mistake in hindsight. Over time that apparently created some stress pressing outwards on the shell, and when I loosened the steel band to clean the top/bottom prior to replacing the gasket the stress was released and the bottom shell popped. Since then the re-tightened band and the table have been holding it together, but the crack has widened over time as the lower ends moved apart. The good news is the boss is feeling generous and has insisted I not only replace it, but get the larger one to boot. Gotta act before the moment passes. I think I have settled on the Kamado Joe, every bit as high quality as the BGE and better equipped for less money. On the 80/20 front I got to use my angle drilling jig last night, 4 lengths of 45" hard maple with 14mm holes 64mm O.C. @ 2 degrees. Probably an hour of setup and drilling, filled with Peter Mulvey tunes, overall a very nice evening. Used the same setup to cut the parts (with parallel guides and a 90 degree cross-cut guide) and then hold them during assembly. Thinking about it I realized that this is the preferred setup for at least half of the work I do on the MFT. While in central PA a week ago I stopped at Grizzly and spent a couple hours wandering around the showroom in a daze. Amazingly this little vise, and some sanding disks, was all I brought home. Keep up these posts, very helpful. Have built your table extenders and found them most useful. Then, following on your post showing how 8020 extrusions hang on Festool MFT extrusions, I have built 2 lamp stands, one saw holder, one battery charging station, and one dog house as add ons to my MFT. Now finalizing design for combination 8020 and Baltic Birch "MFT like" rolling cabinet and router table. Thanks again for the inspiration and tips. One small lesson I might share. I don't have/need a chop saw but did need to cut 8020. Saw small, low cost Hitachi 10" chop saw ( C10FCE2 ) at Lowes for $129. Added 80 T Al balce from Tenyru. Cuts 1515 like hot knife thru butter. I want to see some pics, especially the dog house! Dave, Rusty beat me to it. Dog House??? I half finished a rolling 80/20 MFT-ish cart, now I am considering tearing it apart and redesigning. Would love to see your ideas. Here are a few random shots, in no particular order. Awesome work. Where did you get this part? I've not seen something like that before. The bracket looks like an 80/20 3 way corner bracket part number 14113 on page 309 of their catalogue.